Work is proceeding on various sci-fi greenskins at the moment. My current painting goal is to complete my Deadzone Marauder faction, but I have been using the opportunity to work on some of my other orkoids. I find that working on a variety of miniature styles while using the same palette helps to delay burnout. 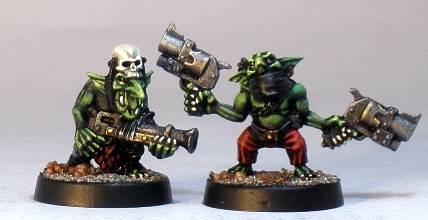 I really like these plastic goblin miniatures. There are hobbyists out there that dont enjoy the oversized faces on Games Workshops orks and goblins, but I really enjoy painting them. Plastics? I am not familiar with these guys. Very nice work on the musculature. I think your “expediency” style’s forte is on smaller models. They are the current plastic set that has been around for s few years, probably since the Black Reach set and the current Ork Codex was released. They are great models and its a great kit. A number of the sculpts are very obviously based on the Brian Nelson grots from GoMo that redefined the look of the species. You have what amounts to metal versions of a couple of the guys that are currently on my painting table. The “expediency” style is harder to get to an acceptable level on wide expanses of flesh, so I put a little more time on these guys than might be expected, although still a lot less time than I spend on one of the orks. It does look good on the gobbos though. Looking good, I like your greenskin style. The dark/light contrast makes them look mean and brings out the comical side at the same time. I very much like this style of Gretchins, I have a couple of the Gorkamorka models painted for my 40k horde. The Brian Nelson style orkoids were a revelation when they appeared. There has been something of a backlash against the style since with some finding the faces too comical and large, but I love painting them. Getting the balance between the Three Stooges elements and the savage green ape-monster elements is tricky though. The high contrast thing came about after a lot of trying different methods that took me too long to achieve, but I do like it. Its quite quick to achieve and I like the end result, a win-win.